In May 1517, Luigi of Aragon, one of the most wealthy, cultivated and well-connected of Italian cardinals, left Italy for a leisurely tour through Germany, Switzerland, the Low Countries and France, which lasted until January 1518. Too grand to keep a record of his own movements, he was well-served by his chaplain and amanuensis, Antonio de Beatis, who day by day kept a steadily enthusiastic record of the scenes they passed amongst. The range of de Beatis's interests was quite remarkably wide. His descriptions of individuals, landscapes, towns, of whole regions and the characters and customs of their inhabitants, of churches, palaces, relics and works of art provide one of the clearest impressions we have of the physical quality of life in north-western Europe in the Renaissance. This range owes something to the company he kept. Without the Cardinal he would not have had the organs played in the churches they visited, would not have watched Raphael's tapestries being woven in Brussels or met Leonardo da Vinci at Amboise. But it owes still more to the traditions which by 1517 suggested not only what a curious traveller should look at but the way in which he might organise his impressions, and express them in writing. 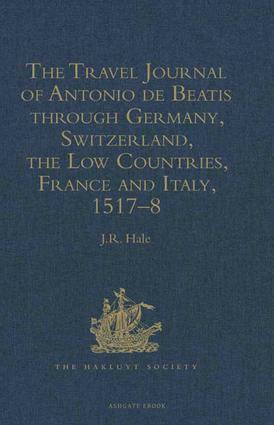 For this reason most of the editor's Introduction is devoted to providing a pioneering account of the evolution of the Renaissance travel journal. Though the Italian text published in the German edition of Ludwig Pastor in 1905 has been frequently quoted by political, social and art historians, the Journal has not previously been translated into English.